Recently, we got the very first press images of Samsung Galaxy S10e which, in case you still don’t know, is the cheapest of the all three phones launching on February 20. That leak also revealed that the phone would launch in some interesting color options like Yellow, Green etc. 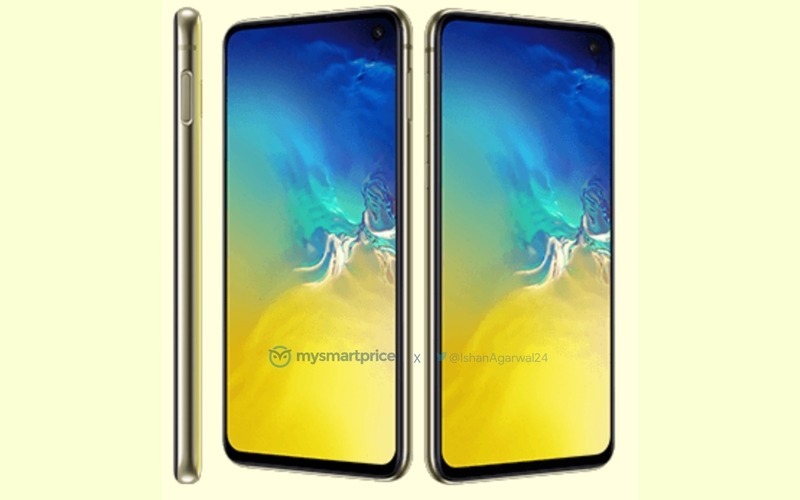 Today, the official press images of the Canary Yellow S10e were shared by MySmartPrice, and these renders give us the first look at the Galaxy S10e in Yellow. As you can see, the Canary Yellow Samsung Galaxy S10e looks eye-catching since this is a color we don’t often see with most of the phones. Apart from this color, the Galaxy S10e is coming in Prism Black, White and Green color options as revealed in the previous leak. The S10e has a 5.8-inch Infinity-O display like the S10 and S10+, but the display is flat and not dual curved. There is a small chin on the bottom, but overall, the design is impressive. There are dual rear cameras & a side-facing fingerprint scanner. Other confirmed specs include 6GB RAM, 128GB ROM, 3,100mAh battery, Android 9 Pie etc. Like the S10 and S10+, the Galaxy S10e is also expected to feature the Exynos 9820 / Snapdragon 855. The price for the European market will be around 749 Euros.